Roll call for HENDYWOOD campers. Edited 1 time(s). Last edit at 06/18/2013 01:08PM by Tarzan. Re: Roll call for HENDYWOOD campers. 6th years straight! Should b there Thursday! I'll be there on Tuesday the 18th as well, assuming of course that my truck doesnt break down. How bout that for positive thinking? Started packing camping stuff into the truck today. I know your in #42 right behind me Tarzan, correct? We'll be there, right across the street from John and Emily! We'll be rolling in on Thursday 6/20, site 18, at/by/for 4:20. Cant wait to c u all!!! Did u snag 29 Jeff? Glad 2 c u guys back! Edited 1 time(s). Last edit at 06/11/2013 10:47PM by J_72. AJ & Nancy coming in on the afternoon of Wednesday the 19th. Site # 11. Big up Hendy Woods posse! IRIE! You should stop by, we are site #34 Everyone is more then welcome to stop by, say hello, and check out the scene. 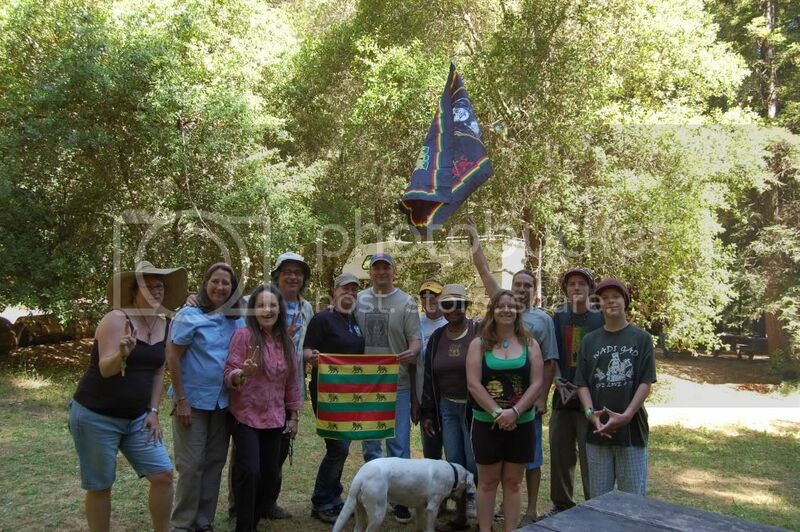 We loving hanging out and camping under the redwoods at Hendy Woods in the week prior to the festival. And most of all, its great to meet up with good friends that we have known for years and only see once a year. The relaxing and irie vibe in that park is the perfect compliment to the somewhat hectic and busy schedule of the festival weekend. And, I might add, it seems the park is really popular this year with non-festival people as well. I looked at the bookings and most sites are filled the full week before and after the festival weekend. This is the first time I can recall we have people leaving our site the day we arrive and people coming in the day we leave. Also, I have a couple bottles of unopened Sangsters Rum Cream that I really need to use up, including a large unopened tin of Tastee Processed Cheddar Cheese that has been in the frig the whole time...Both of these products are Jamaican classics and were purchased there in a visit in 2009. The cheese says best before Feb 2011 and the Rum Cream has no use by date. I'm pretty sure the cheese is OK but not really sure about the rum cream shelf life. I researched the rum cream and people had varing opinions on how long that stuff remains good when unopened. Most people seemed to think you will be able to tell if its bad when you open the bottle. Danny, can you sample the rum cream before me ? It great in the morning coffee. Edited 2 time(s). Last edit at 06/12/2013 05:21PM by Rhythmwize. Ha sure Johnny my pleasure as always! Wasnt always a big coffee fan, but u and Emilys blue mountain & rum cream is toppa top! Cant wait! Anyone here in 27 on monday? hey danny, we will driving up wednesday morning... PM me a # to get a hold of ya..... bless up and travel safe mi bredren. Big Shout out to the Hendy Woods Crew! Come by & Say "HI" ! The "set up crew" arrives Wednesday and me & more friends pull in on Thursday and it should be warmer weather for the weekend then last few years - we all say "YAY" to that - more river time!!! Heck yeah. If u need any help all Crucial's on deck to lend a hand as always! See you there I can barely contain the excitement! We are in Kettleman City this morning and will reach Hendy this afternoon. See you soon John & Emily. Comin down from Eureka, should b there early afternoon. Looking forward to seeing these good people! Hendy here we come!